If the Alchemical Dream was a Utopian vision of transcendental Humanism, we enter the 21st century feverishly sweating through an Alchemical Nightmare. Science is rejected in favor of capitol; the psychoactive experience has been criminalized; our culture is a vast desert populated with sitcoms and listicles. What horrors lurk therein those barren wastes? We’re interested in Weird stories inspired by the heritage of the alchemists; contemporary, allegorical, or historical fiction; personal essay; your own manifestos; hermetic philosophy; cyberpunk dystopian psychedelia. 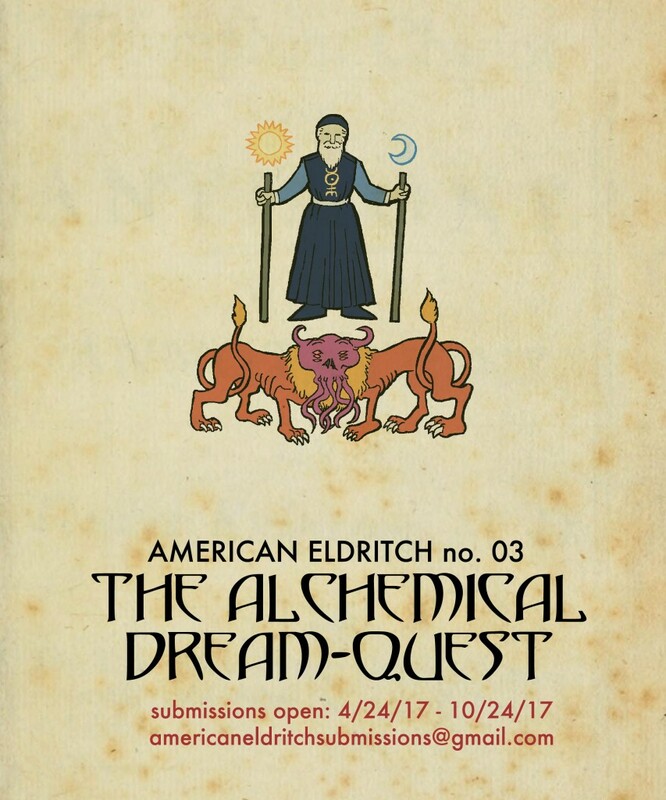 We’re open to diverse interpretations on the theme – if you have an idea but you aren’t sure if it fits, feel free to send an inquiry to americaneldritchsubmissions@gmail.com. Submit a finished story to americaneldritchsubmissions@gmail.com, with the subject line “Fiction / Nonfiction [Your Name]”. Attachments are fine, but the text of your story in the body of the email is preferred. Reprints are OK, but please note where they have previously appeared. Shorter works are preferred. Receipt of your submission will be confirmed in 1 – 2 business days, and then you’ll be notified within a month if we’d like to publish it. Compensation is a purely ceremonial $5 (but it’s also a literal $5, sent through paypal), and an advertisement in the back of the book, if you want one. You will be asked for a short bio. All stories will be accompanied with some sort of visual component. Let us know if you’d like to have a hand in the design or illustration of your submission. If you have a great idea for story, but, you’re ineloquent with prose and you know it: your self awareness is both appreciated and welcomed. Feel free to shoot an email to americaneldritchsubmissions@gmail.com with the subject line “Rough Fiction / Nonfiction [Your Name]” and your best attempt at a draft (you have to try to write it, feel free to provide a summary as well). If the bones of the tale are good, we’ll either hook you up with invasive edits or a ghost writer to do another draft. Haven’t you always wanted to be a writer? The power was inside you the whole time. You have final approval over publishing. $5 compensation. If published, you will be asked for a short bio. Submit them! Our format is 8.5 X 11, black and white, with full bleed (so your splash pages can go right to the edge of the page, if you wish). There’s also a color comics anthology in the works; feel free to inquire. Send an email to americaneldritchsubmissions@gmail.com with the subject line, “AE COMICS [Your Name]”. Compensation is $5 per 2 pages, and, if you’d like, advertising space in the back of the book. Do you draw pictures? Are they good? Will you draw good pictures for cheap? Let’s be friends. Each issue of American Eldritch features classic reprints with new artwork, as well as fully illustrated new literature. If you’re interested in being a contributing artist, send an email to americaneldritchsubmissions@gmail.com with the subject “ARTIST INQUIRY [Your Name]” and a portfolio of artwork (make sure there’s some B&W stuff in there). We’ll let you know if we have any available assignments that are appropriate for your style. Compensation is $5 – 10 per story, and you’re welcome to advertising space in the back. The book is 8.5 X 11, full bleed, black and white, and it’s printed with lasers. When your artwork or story is purchased for print, American Eldritch reserves the right to non-exclusive publication in perpetuity (specifically for this title, American Eldritch vol. 3: The Alchemical Nightmare, and for use in online / promotional content). You still own your own work, the copyright will be published in your name, and you can republish your work whenever / wherever you want. We will not reprint your intellectual property in another collection without first contacting you for renewed permissions (and hopefully we can offer more money the next time around). We won’t do ads for money because that’s so gauche, but if you have a book / project / patreon in which you think our readers would be interested, there’s a section for advertisements in the back. Contact americaneldritchsubmissions@gmail.com and maybe we can find you a space.